That’s more than twice the accepted estimate of silly folks who think Elvis is 76 now, watching his old movies and collecting Social Security in a secret somewhere. How could so many presumably normal citizens (19%, according to Zogby) be so ignorant as to…. …not believe the claims of their duly-elected president and the detailed accounts by his deputies of the deadly dark-of-night raid deep into Pakistan by a team of Navy SEALs, the firefight and the flight with the corpse to an American carrier offshore, the confirmation of his DNA, the preparation of his body according to Muslim ritual and its hasty burial somewhere at sea to avoid creating a shrine? All this within 12 hours? Even Al Qaeda has confirmed its leader’s death. But wait! Isn’t that what terrorists would be expected to say to convince enemies to abandon their 10-year manhunt? After so many lies and misleading claims by politicians over the decades since the Kennedy assassination and its conspiracy theories, the safest way to look wise and experienced these days is to dismiss virtually any public official’s statement as a talking point and/or lie. President Obama watched the raid live via satellite and has seen the photos. Because he himself was convinced of Bin Laden’s death, the president deemed providing visual — albeit allegedly gruesome — photographic proof to any doubting fellow Americans was unnecessary. The people could take his word for it. And he worried it would seem vengeful, even though nearly 3,000 died on 9/11 and another 1,573 Americans have perished in combat against Al Qaeda in Afghanistan in what on Obama’s watch is now the country’s longest war ever. Obama said he wanted to avoid appearing to spike the football in the end zone, although that desire didn’t keep him from a ground zero victory lap and talking Bin Laden killing at two subsequent Democratic party fundraisers. That dismissed domestic concern was outweighed, Obama aides explained, by the president’s concern over inflaming those jihadists who’ve been violently killing American infidels and many of their own faith for nearly two decades. 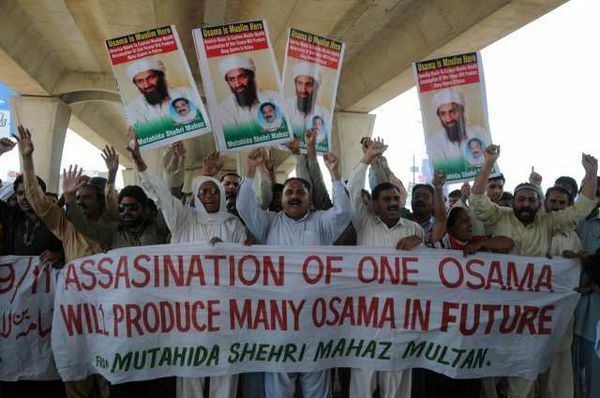 So no Bin Laden corpse picture because why, some have since asked, the lack of one photograph will somehow prompt these crazies to doff their bomb belts? Or be a kinder, gentler captor of future prisoners? Could any American commander-in-chief seriously believe this? Additionally, Obama aides’ eager and hurried attempts to tell the raid story to their boss’ best advantage lead to countless conflicting details and confusing inaccuracies. The botched recounting turned a PR homerun into a merely impressive triple, needlessly eroding Obama’s credibility even among those wishing Bin Laden ill.
To assuage criticism among some influential Washington pols — the people who really matter in Obama’s non-fundraising day-to-day world — he offered to show the not-so-nice photos to select members of Congress. However, although global audiences have been treated to countless photos of atrocities and gruesome scenes in recent years — severed heads online, bound Abu Ghraib prisoners, Saddam Hussein hanged and burned, mutilated American bodies hanging from a Falluja bridge come vividly to mind — Obama clearly was more concerned about possible foreign reaction than domestic disbelief, which he doesn’t place much stock in. A strange reaction from someone who tried for four years stonewalling skeptics of something as simple as documenting his birthplace, only to finally give in and release his sealed long-form certificate just this spring — and then see virtually all the wind immediately disappear from the sails of the so-called birther movement. Operating in a longtime one-party city like Chicago, Democratic politicians do not often feel beholden to explaining themselves to the obedient public. So, the lesson this president from there obviously drew from his unnecessary birth certificate-sealing confrontation was to do it again with the Bin Laden photos. This entry was posted in Current Afairs, everyday life, Uncategorized and tagged america and osama bin laden, americans believe osama bin laden is still alive, commando team, is america afraid of osama bin laden, is osama bin laden dead?, is osama bin laden still alive, latest news about osama bin laden, libya, middle-east, osama bin laden still alive, photos of osama bin laden, politics, pollster john, street celebrations.